These Candle bulbs feature 3 individual LED chips with a frosted glass cover which produce a light output equivalent to a 40 - 50 watt halogen bulb. These Candle bulbs give a huge 360 degree beam angle, providing maximum light output at 300 lumens. 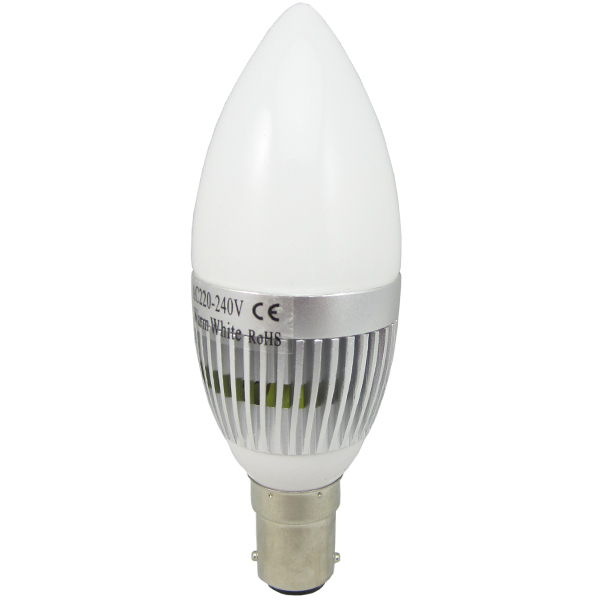 These bulbs are one of the most efficient available working at only 3watts, although the bulbs appear to be very similar many competitors only manage to produce 200 lumens or less at this wattage. 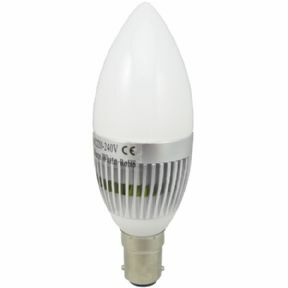 These LED bulbs are a standard size and are a direct replacement for your existing Candle bulbs. Although they are initially more expensive to purchase than a standard bulb due to the fact they have a life expectancy of 50,000 hours and the potential to reduce your electricity consumption by up to 93%, many customers experience a payback period of less than 3 months. With this sound investment you are the saving on electricity and replacement costs year after year.